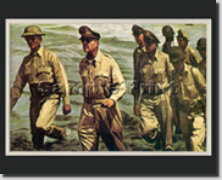 This reproduction print depicts a great vintage photo of General Douglas MacArthur during a <?xml:namespace prefix = st1 ns = "urn:schemas-microsoft-com:office:smarttags" />Battle in the Philippines during World War II. Fulfilling his promise to the Philippine people that he would return to the Islands at Leyte. October 20, 1944. Canvas size is 8x10 ready for framing. You can add your own personal matte or leave it is with the printed matte. These prints are made to order.